How to get there: See the description for Jade Mountain. Route description: From the trailfork just below the summit of Jade Mountain (the main peak in Yu Shan), head down a broad gully (scree and talus). This trailfork is just at the top end of the wind protected section of the trail from the Paiyun Lodge to the summit. The location is N23:28.227, E120:57.361, elevation approximately 3863 meter. You will descend to a second trail fork, where you stay left (the right fork continues down towards the valley below). Soon thereafter, you arrive at the first of several local cols along the north ridge. The trail continues nicely along this ridge, then climbs gently to the North Peak summit. This summit has a weather station building near its top as well as a fairly large section of solar power cells. There are people living here (working for the weatherservice), the highest permanently occupied building in Taiwan. The summit ridge is just next to the building, a short ridge that is almost horizontal, but likely slightly higher at the end closest to the building. Comments: I climbed this peak solo. I left the main summit at 1100 and reached the North Summit at 1200. I spent about 10 minutes there before heading back towards the main summit. I reached the trail fork at 1315 (quite tired!) and continued rather slowly downhill to the Paiyun lodge at 1400. The next morning, I descended from Paiyun lodge and proceeded north to Shei-Pa National Park. 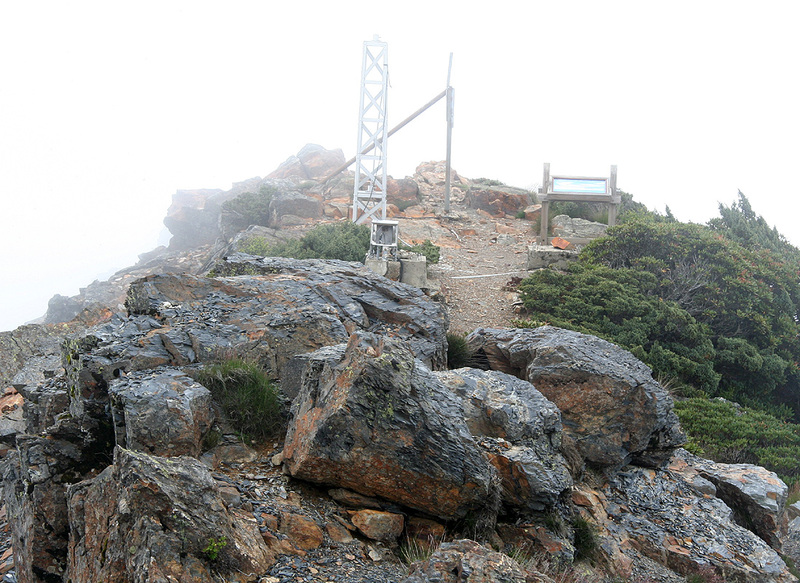 The next target was the second highest peak on Taiwan, Syue Mountain.